Stephen Muhammad, born Stephen Booth is the fifth of seven children and was born at Lackland Air Force Base in San Antonio, Texas on January 24, 1962. His father served as a career military soldier and in two years, would move his family to Münich, Germany. Years later around the age of 10 or 11, young Stephen learned chess from his older brother Timothy who had learned the game from their father. Stephen would defeat his brother in their first game after learning the moves and Timothy would never play him again. Later Muhammad would take a liking to the royal game but his interest really took off after spending time at Santa Monica beach in Los Angeles, California. Known for his blitz prowess, Muhammad has scored well in classical chess, having recently fulfilled the norm requirements for the IM title. He earned his 1st norm at the historic Wilbert Paige tournament in 2001 (won clear 1st) and his 2nd at the 2002 World Open (performance rating of 2634)! At the 2002 Chicago Open, Muhammad qualified to compete in the 2003 U.S. Championship held in Seattle Washington. 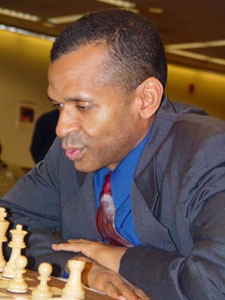 He is second (to GM Maurice Ashley) person of African descent to qualify and it was at this historic event that he earned his final norm for the IM title. Muhammad is also a four-time Georgia State champion. He qualified for the 2005 U.S. Championship and also qualified for the 2006 U.S. Championship. He was conditionally awarded the IM title at the FIDE Congress (appropriately so) in Abuja, Nigeria) and it was confirmed in March 2007. Very focused and determined, he hopes one day to earn the coveted GM title and enter the annals of history as a player of rare abilities. Read "Talking Drum" interview on Muhammad!